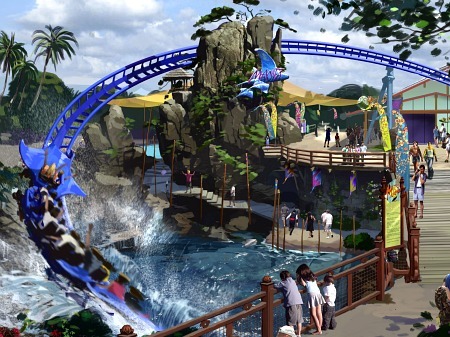 February 9, 2011, 6:00 AM · SeaWorld San Diego this morning confirmed details for its version of the Manta roller coaster, which will debut at the Southern California theme park in 2012. This Manta will be a Mack Launch Coaster, smaller in size and intensity than the Bolliger & Mabillard Flying Coaster that shares the same name and theme in SeaWorld Orlando. Like its Orlando sibling, however, San Diego's Manta will incorporate underwater viewing of rays in its queue. The park will enhance its existing Forbidden Reef section, where visitors can touch and feed bat rays, and incorporate it as part of Manta, as well. "We are delighted to bring energizing new attractions to our guests year after year," SeaWorld park president John Reilly said in a statement, "and Manta does just that, combining the thrill and excitement of a coaster, with the educational and entertaining value of an incredible marine-life exhibit." San Diego's Manta will blast riders out of a launch tunnel within which larger-than-life images of rays will be projected onto a 270-degree screen, using a projection system that the park calls the first of its kind in the United States. Despite the high-speed launch, don't expect a too-intense experience, though. This Manta's speed will top out at 43 mph and the biggest drop will be 54 feet. (The coaster's maximum height will be just 30 feet; tunnels will allow the coaster to drop farther.) Compare those stats with the 113-foot drop, 140-foot height, 56 mph top speed and multiple inversions for the Orlando Manta, which won the 2009 Theme Park Insider Award as the year's best new attraction. Thoughts? Questions? How do you think this Manta will match up with other new attractions coming on line in 2012? Update: Here's a (rough) concept video from SeaWorld. The train on the video doesn't have the promised manta ray decoration, nor do the surroundings match what's in the park at that location. Nor is the launch tunnel included. But it does give you a rough idea of what the track layout will be like. February 9, 2011 at 7:25 AM · I think it is great! Sure we all would have wished for a larger ride, but considering how hard it is to pass a roller coaster past the San Diego Council, this is a big win for us! Also, the theming looks really nice, and I am sure while the height and speed is limited it will still be a pretty fun coaster. February 9, 2011 at 9:10 AM · I'm fine with it being smaller. This isn't Orlando where we have a dozen theme parks all competing with the biggest/best coasters. This is San Diego. We have three parks based on being animal conservatories. The coasters are just an extra customer draw and like the previous poster said, getting something like this past the city council is like getting blood from a rock. As long as it doesn't overshadow the needs of the animals just for the sake of being a tourist draw, it's cool. I'll definitely go there to ride it. The concept art looks pretty neat. February 9, 2011 at 9:41 AM · From what I understand, the issue isn't the city council - it's the California Coastal Commission. Unlike the other two SeaWorlds, the original San Diego park is actually located next to the sea, on Mission Bay in San Diego. That makes it subject to the coastal commission's regulations on development. One of those regulations restricts the heights of buildings within certain distances from the waterfront. Where Manta is to be located, the height limit is 30 feet. So unless SeaWorld wants to bankroll a statewide ballot initiative to overrule the commission (please, for dear God in heaven, don't go there), that's what they're stuck with for now. Now, you can correctly point out that height restrictions are widely inconsistent up and down the California coast. Port equipment soars above 30 feet. So does development along the waterfront in San Francisco. The Santa Monica Boardwalk and Santa Cruz Beach Boardwalk each have waterfront attractions that exceed 30 feet. But the commission is trying to hold the line on new development along the coast. And local support for the coastal height restrictions in San Diego County appears especially strong. Personally, I think there's a huge difference between a roller coaster track 100 feet in the air and a 100-foot tall building. (Think total mass of the structure.) But that's not a distinction that's built into the California Coastal Code. February 9, 2011 at 3:17 PM · I was about to post a point, but Robert covered it in his last paragraph. A (well-maintained) roller coaster silhouette on the coast could be very appealing, even artistic. Regardless, this coaster seems to capture the spirit of a manta ray better. The sudden acceleration and drifting curves are more reminiscent of a manta ray's movement than a slow, steady climb followed by corkscrews, loops, and barrel rolls. February 9, 2011 at 3:39 PM · Before I viewed the video I was excited, I thought that the roller coaster would have a more massive appeal since it would allow more people to ride and enjoy it possibly. However, After watching the video...... It seems like the not flying along part takes away from it seeming like the Manta experience somehow.... like sitting up right does not make as much since with the concept I guess. Had I not seen the flying version before, and seen how it seems to go with the swimming through the water type vibe a little more than sitting up right, I may not have thought this. February 9, 2011 at 6:53 PM · I think the coaster sounds terrific! I live in Orlando and get to ride Manta East a lot, and I am already planning a trip to San Diego just to ride Manta West in 2012! Great job SeaWorld- keep it up! February 9, 2011 at 10:04 PM · I like the new coaster. The San Diego park needs something new that’s more of a thrill than a chill. I think what's best is the coaster really feels like your on the back of a Manta Ray gliding, banking, and diving. Hopefully it won't disrupt the area to much, that side of the park is already jam packed with attractions and scenery. Looking at the video it looks like they are going to utilize the open picnic areas near the center of the park. After adding the new Shamu show and the Horizon's show It looks like 2012 is going to be a fresh breath of air into the park. February 10, 2011 at 12:38 AM · This is great news. SW San Diego is an excellent park and this attraction will make it better. I love the fact that the special circumstances surrounding the San Diego park doesn't stop Sea World from making this ride. 2012 is a big year for Southern California. Much like 2004 when DCA opened the Tower of Terror, Universal opened Revenge of the Mummy, and Sea World Journey to Atlantis. In 2012 we get Carsland to DCA, Transformers to USH, and now of course Manta to SWSD. Can't wait to learn more about the layout of the ride. February 10, 2011 at 9:21 AM · So, do you think this means Sea World San Antonio is next in line for something new?